You Can Paint With Oils! An easy and fun introduction to landscape painting. 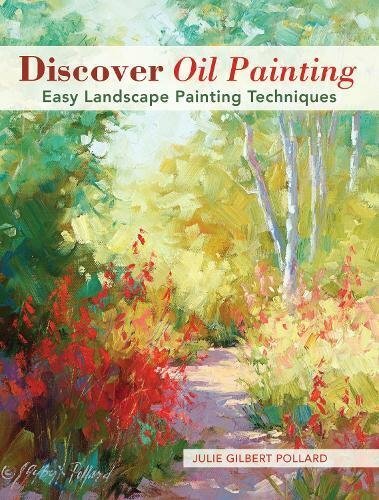 Discover Oil Painting is a complete course on painting landscapes in oils. This fun and easy guide is loaded with time-honored methods, techniques and tutorials along with ways to tweak those ideas to suit your own painting personality. No matter what your experience (or lack of experience!) you will learn how to paint beautiful works of art in no time. With master teacher Julie Gilbert Pollard, you will walk through the painting process in manageable steps, from laying out a palette and overcoming the initial intimidation of a blank canvas, to designing strong compositions and achieving brilliant, yet believable color. Along this path to successful landscapes, you will find the stepping stones to losing yourself in the journey and discovering the pure pleasure in painting with oils and using your own creativity.